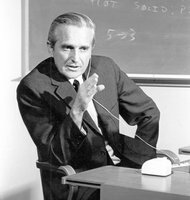 A lot of people are writing about Doug Engelbart one of the true pioneers of computer technology. Many of them are recounting their interactions and friendships. I only met him once. It was about 1967 or 1968 and I was around 22 years old and working with Joe Kamiya at the Langley Porter Institute (UC Medical Center) doing the first work in brain wave bio feedback. I don’t understand why we went down to SRI in Menlo Park, where Engelbart was working. It may have had something to do with a problem that NASA was experiencing with some of their astronauts (they were having Astro Projections or out of the body experiences). They wanted our advice. I can’t say much more about this but I thought of our project as “Astro-Not”. I think SRI was involved. Maybe if I think about it a bit more, it will come back. But I do remember going into a big room where there were many young people (young at the time but probably senior citizens like me now) seating in front of video screens (we were still using teletypes on our computers) and using what was the first mouse. Doug was there and explained something about collaboration. I remember that while the mouse was important, it was just a means to interact. My impression was it was all about humans interacting with each other via computers. I had no idea how powerful that concepts was at that time. In those days I was programing a computer (PDP-7) that had a fraction of the memory of a photo I take on my iPhone. I had to program in assembly language. I would make things out of single transistors, resistors and capacitors. While I had already fallen in love with computer technology, I was learning to become a scientist and was interested in the mysteries of the human mind. But I knew that I understood digital logic extremely well. I also had a sense that things were happening in Silicon Valley but at that time it was driven by military contractors. The thought of starting a computer consulting company even pop’ed into my head. I remember making a business card that had the name of the company I considered forming. It was called B.I.T. for Biomedical Information Technology. But I did not go ahead with that. It took me more than 12 year to actually leave medical science for the computer industry and probably 15 years before I held a mouse in my hand again. Little did I realized that day at SRI, how the world would be changed by the ideas of Engelbart. Had I known, I might have just stayed in Menlo Park. Tags: Doug Engelbart, SRI. Bookmark the permalink. Uri Geller was the guy SRI was studying for the remote viewing project. He was best known for bending spoons just by gently touching them. I was at Xerox PARC when Bill English (one of Englebart’s colleagues) joined the staff, and brought the mouse with him. The original mouse you saw had two disks that rotated a potentiometer to indicate position. The Xerox PARC mouse used a single bearing ball driving two wheels that sent digital pulses to indicate movement. This is the technology that Apple saw and “borrowed” for their projects. If memory serves, Doug went to Tymeshare for awhile.to further his work on collaborative computing.